Quang Phu Cau, Vietnam -- I come from India, so I am used to seeing color. 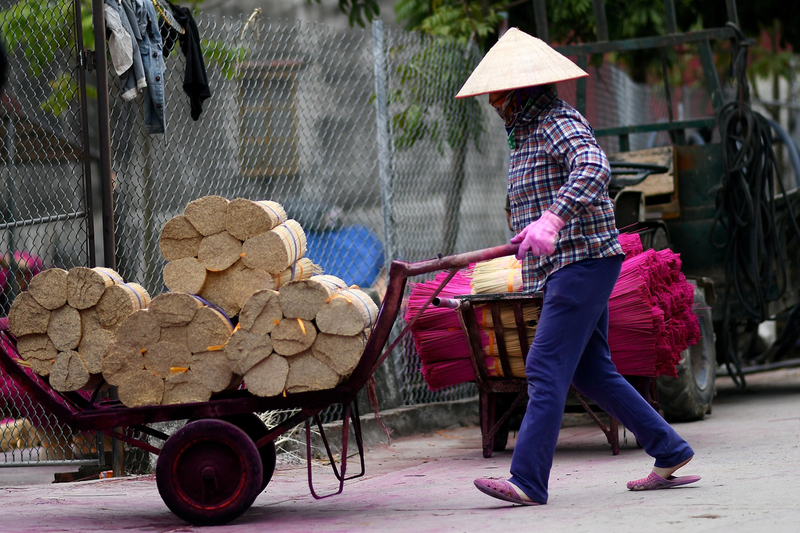 But I saw color in a whole new light in a tiny village on the outskirts of Hanoi in northern Vietnam. I chanced upon it while searching for interesting things to photograph ahead of the Tet festival, the Vietnamese lunar new year and the country's biggest holiday. Shooting features is one of the things I enjoy most about being a photographer, so I always look for compelling stories to be told in images. Vietnam is my newest posting and I arrived only two months back, in November. Knowing that Tet was the biggest celebration in the country, I started exploring the internet for ideas. 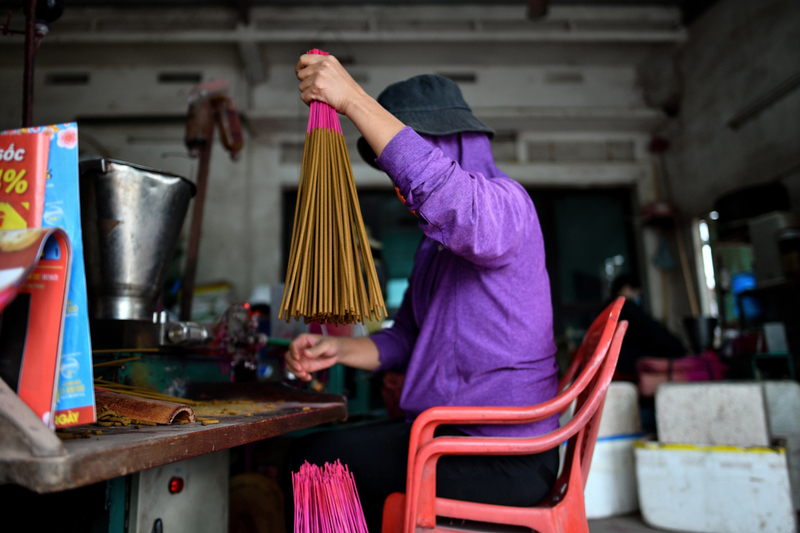 That was how I came across Quang Phu Cau, one of the few villages in the country that makes incense sticks for the new year celebrations. I thought it had potential for a strong visual story, so along with my text and video colleagues, went to check it out. It sure didn’t disappoint. There were carpets of incense sticks laid out in various parts of the village. What really struck me was the color. I’ve seen incense burning thousands of times and it’s always the aroma that your senses notice the most. But when I saw the display of dyed incense sticks, it hit me — “this is the color of that aroma.” If you visualise it in your mind, this is what the smell of incense looks like. This is the color of incense. Incense production is a family affair here. 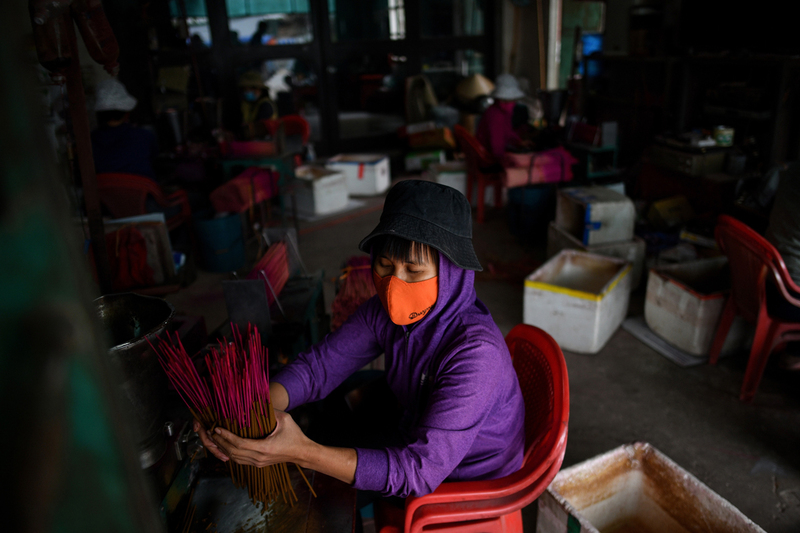 Villagers have been making incense from bamboo for centuries. You have parents, grandparents, children joining in after school. This is the busiest time of the year and they are used to the attention. So when I was around, few stopped what they were doing, and some even offered assistance. It was cloudy on one of the days I was there and one man came up to me, pointing at the sky and shaking his head. I don’t speak the language, so it was only later that I learned that he was trying to tell me that it wasn’t the best time to shoot. You need sun for the dyed incense sticks to dry properly, so when the sun is out, there are more incense out in open spaces. One difficulty that I’ve often encountered when shooting features in Asia is that people are camera-friendly, I know that sounds weird. But often when they see me with the camera, they smile. Which is great on a personal level, but not ideal for my photos, since I’m trying to capture them as they are. So you just wait and spend time around them, because after some time, people get used to you and stop noticing you because they invariably have more important things to do. And that’s when you start taking your pictures. But in this village, I didn’t have to deal with that too much. Partly because the people here are used to the attention -- as one of the few century-old villages making bamboo incense sticks, they attract plenty of visitors. And in today’s smartphone-equipped, social media-frenzied society, they are used to visitors snapping pictures of them. And partly it was because they just didn’t have time to waste. 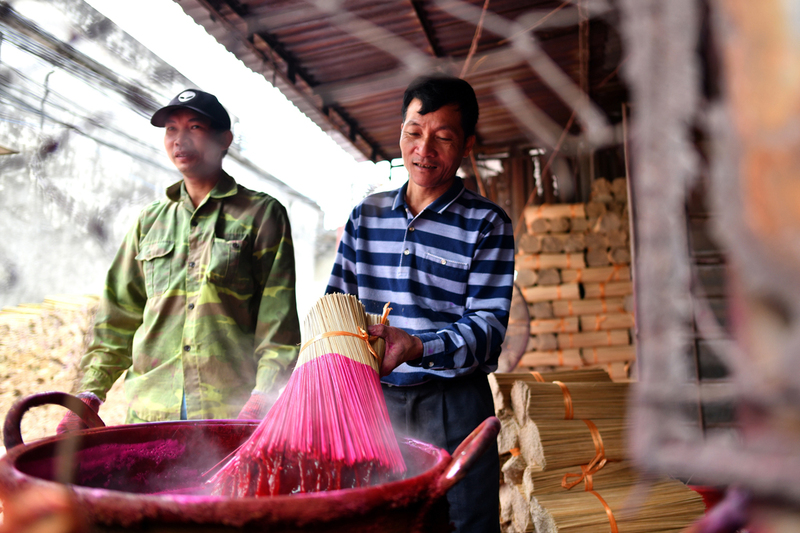 With the Tet Festival approaching in early February, time is of the essence to these craftsmen. So they just concentrated on that, ignoring everything else. Even my drone. I went back a second time as I wanted to show a birds-eye view of the visually striking and fascinating incense carpets. I thought that my drone buzzing overhead would attract some comments or stares. But no-one was impressed and no-one really paid any attention to it flying above. If you’re talking about countries that are rich in color, Vietnam is an amazing place. It’s among the top places that I’ve seen. You see it everywhere, sometimes in the most unexpected of places. Like the daily commute. The other day I was taking pictures on a street and it was raining. I saw people riding motorbikes, covered in colorful ponchos from head to toe. Even the handlebars of their motorbikes and scooters wee covered. I thought about how I could shoot them in an original way and headed on top of a bridge. To me, they looked like mushrooms -- moto-mushrooms. The result was a series of what I think are quite amusing and delightful photos. That’s what Vietnam is like. There is color everywhere and sometimes it just jumps out at you in the most surprising places. Photo chief for Vietnam, Laos and Cambodia.